It is not unusual that, in connection with the excavations in Denmark, finds that can be dated back several hundred years. It belongs however rare, that one finds mass graves. Nevertheless illuminates The Historical Mueseum, you probably have encountered one of the darkest and most dramatic chapters in the history of denmark. According to archaeologists from the North jutland Historical Museum has found a mass grave in central Aalborg, which in all probability contains the fallen from the allied commander, Johan Rantzau storm at Aalborg during the Count's Feud 18. december, 1534. 'the Skeletons is quite clear as they were when they were put in the mass grave, and you can clearly see, that they just simply are put down in the hole on top of each other in great haste,' informs the archaeologist at The Historical Museum, to Kenneth Nielsen, who is udgravningsleder found in a press release. According to him, show preliminary studies, that there are men, and that they have been killed in extremely violent circumstances. Ekstra Bladet has been in contact with the North jutland Historical Museum. Here are rejoicing over the found. There is talk about a discovery from the only civil war, as we have had in Denmark. All of the skeletons have, according to Kenneth Nielsen fierce hugskader, which by all accounts originated from the fight immediately before their death. Thus exclude the he also, that they should be victims of a larger sygdomsepidemi. the Storming of Aalborg was one of many acts of war that took place during the civil war, Grevens Fejde in the period 1534-36. During this civil war, fought Johan Rantzau as a commander for the king Christian the Third, while the Skipper Clement fought for the benefit of the former king Christian the Second. Through written sources, according to North jutland's Historical Museum, that the attack 18. december 1534 was intense with many hundreds killed, and archaeologist Kenneth Nielsen estimates that the battlefield, where they found people have fallen, probably have been in the immediate vicinity. 'It has been about to get the corpses away as soon as possible, among other things, to avoid the epidemic. One can easily imagine that the local people in the past, Aalborg has been forced to dig holes, where they died so, immediately after the fighting was over, has been laid down in,' he says in the press release. 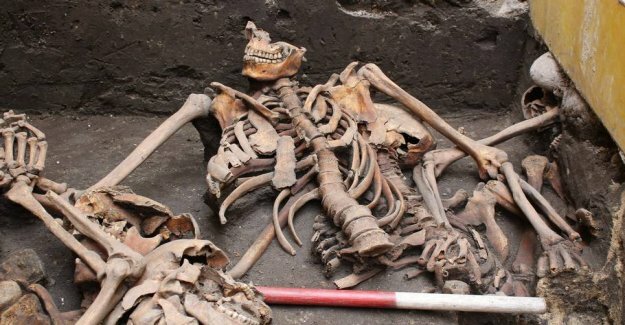 In 2014, archaeologists found a mass grave right next to it. Then showed, among other dna-analyses of 18 individuals, there was talk about local, local citizens, and that the skeletons could be dated to around the time when the storming of Aalborg took place. in Conjunction with the location of the found one could therefore, with some certainty conclude that there was talk about the fallen, who fought in the Skipper (master) clement page.